The German community is one of the most strongest national unions that have been playing a significant role in CMS development from the beginning when Joomla! project was founded. This year Joomla celebrates its 10th anniversary and holding the main J! event in Germany promised to be something special. For me it was first experience to come to foreign national IT event and it was an exciting moment. The event took place at 16-17th of September in Hamburg, which is second largest city in Germany also historically known as a free city-state and a part of Hanseatic League. 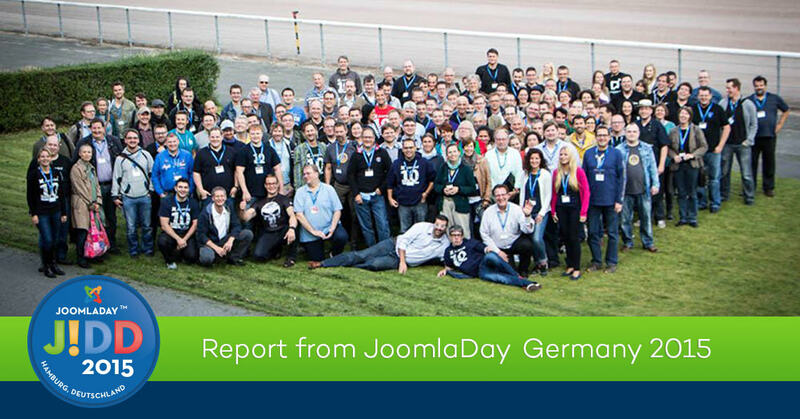 The JoomlaDay was held at Trabrennbahn Bahrenfeld - a green district of the city used for local harness racing track. And it was a good chance to match business trip with cultural purposes: to discover the city and do some sightseeing. The program was rich and divided on 4 rooms with thematic sessions where speakers introduced their presentations, so every visitor could choose what session is more interesting for them. I have prepared a session called Building a Joomla website from scratch: goals, problems, solutions. The main idea of the session is to provide the information for every interested person how to start own small business, how to work in a team, to plan tasks and reach them sequentially. I have consistently told about all steps that need to be completed from the idea until the moment you’ve made an infrastructure and ready to sell the products and reviewed typical mistakes that can occur and how to avoid them. I should admit it was one of the most exciting and worrying moment during the trip for me personally, since it was the first time to introduce a session in English for foreign auditory. I thank everyone who came to my presentation and hope it was interesting. The first day ended with gala dinner and continued with afterparty with drinks: people was laughing, dancing and having a lot of fun. So, it was kind of community spirit. Summing up: I was pleased to visit JoomlaDay Germany: I was able to meet friends and make new contacts, people were friendly and open for discussion. Since I am fan of YOOtheme it was so nice for me to meet the team there. Unfortunately, I couldn’t talk to everyone from the staff, but at least it was first meeting. There were other foreign guests and speakers whose sessions I’ve watched: Sebastian Lapoux demonstrated the power of Seblod (that’s an amazing product at my opinion that deserves developers’ attention since it can get Joomla to another level), Peter Martin introduced us how to do little magic wth Linux command line and Roland Dalmulder told about benefit of using Github and how it’s useful for development. I want to thank organizers of JoomlaDay Germany 2015 and involved persons for giving me a chance to come and to speak, it’s honor and a great experience for me! Building a Joomla website from scratch: goals, problems, solutions.